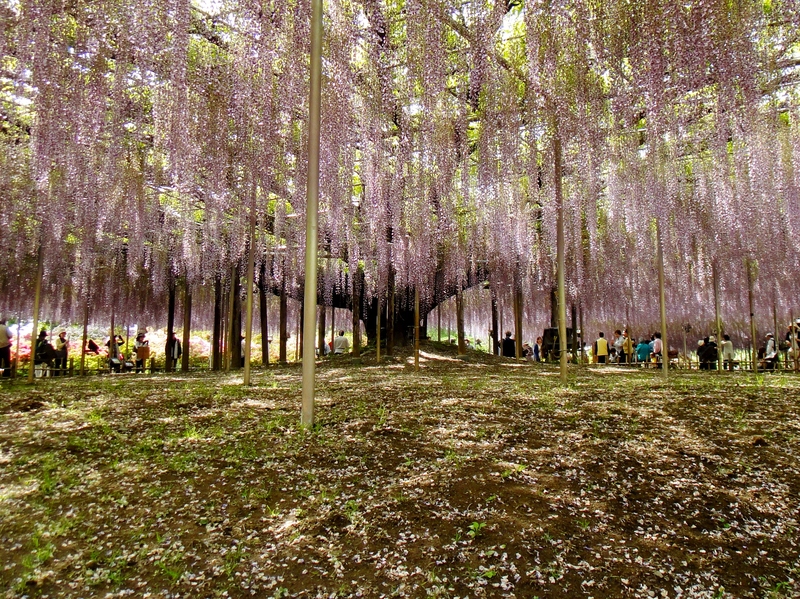 This park has a wonderful array of flowers throughout the year, but is most famous for its spectacular wisteria displays from Mid-April to Mid-May. 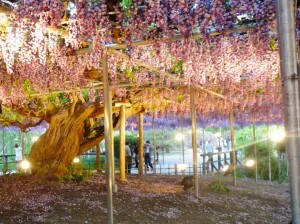 It is thought that one of the wisteria trees was planted in 1870. For more information about this park, and its other flowering seasons, please see this website http://www.ashikaga.co.jp/en/index.html. 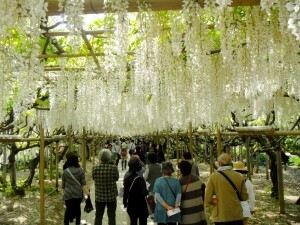 During the wisteria season, English maps of the park are available at the entrance. Restaurants and eating stalls can be found throughout the park. Various food items range from ¥400 to ~¥2000. Restaurant Wisteria has the largest selection, but is probably the most expensive. They have pork cutlets, a sushi-type bowl, club sandwiches and a kids’ curry meal. 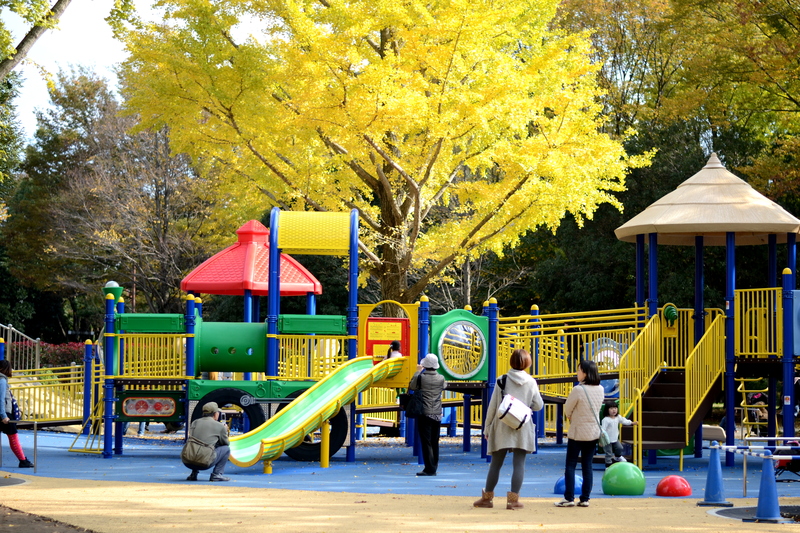 The park is stroller-friendly and there is a large resting/play field for kids to play in. 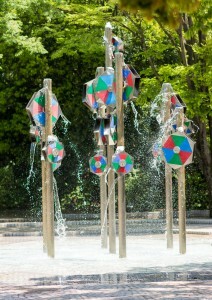 A few playground items are located near the “Local Delicacies Corner” and tunnel of white wisteria. The gravel pathways around the park can be quite dusty so be prepared to bring extra clothing. 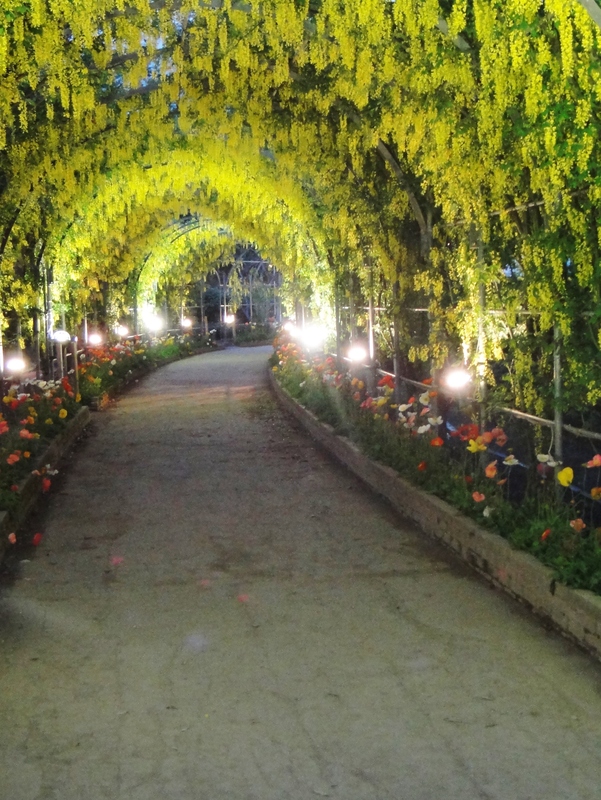 Ashikaga Flower Park is open daily except for New Year’s Day. 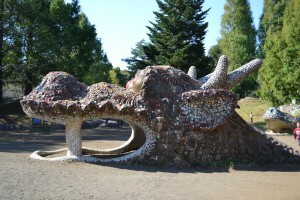 Opening hours vary however, so please check the park’s website. During the wisteria season, the park is open from 7am-9pm. At ~5:30pm the park is illuminated and the wisteria looks amazing. It seemed to be less busy during the afternoon and evening. Admission to the park changes on a daily and seasonal basis. 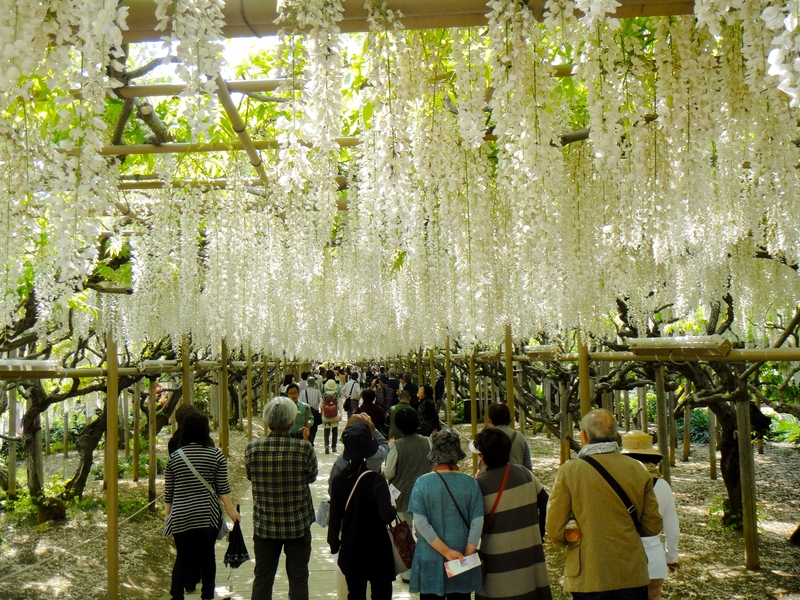 In May 2014, Adults were ¥900- ¥1700, and children over 4 years old were ¥500-¥800 during the wisteria season. 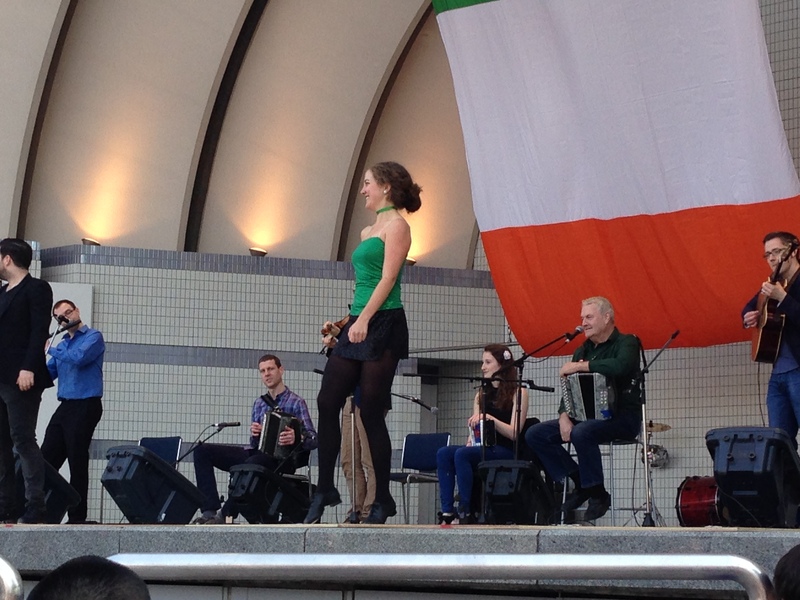 There are also evening admission prices (5.30pm-9pm). 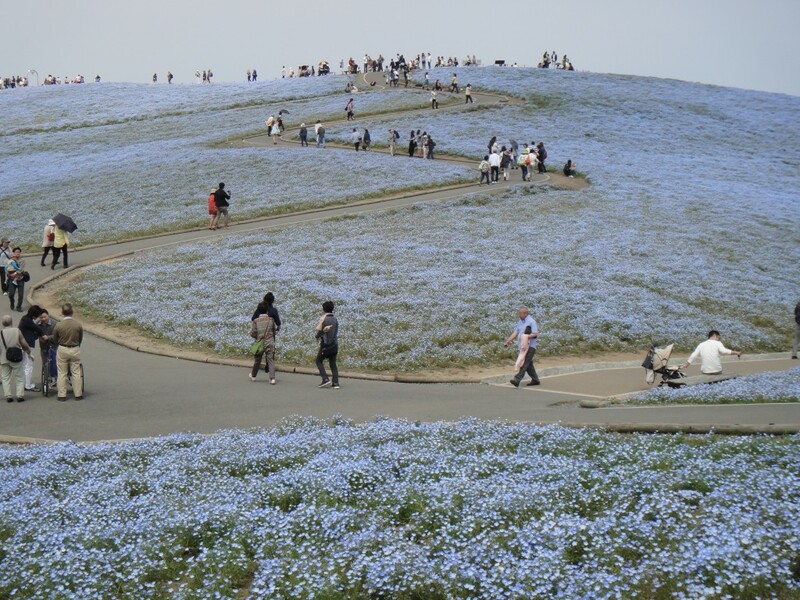 Because we incorporated this visit with a trip to Hitachi Seaside Park, we rented a base van to offset the cost of the road tolls. We took the Kan-etsu and Kita-Kanto Expressways most of the way to avoid traffic and it took 1½ hours from Yokota Air Base. We stayed at Chisun Inn Sano Fujioka. It was inexpensive and basic, but had everything we needed. 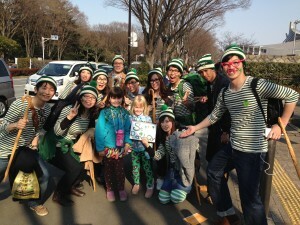 Breakfast was an extra ¥500 per person, but free for young children. GPS coordinates for Chisun Inn Sano Fujioka are 36.29690 139.60001. 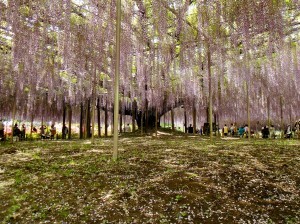 The hotel is about a 20 minute drive from Ashikaga Flower Park. Linda Bell, May 2014. DRIVING DIRECTIONS: There are 2 entrances to the Flower Park, the West Gate and Front Gate. Parking is free near both gates. The GPS coordinates to the Front Gate parking are 36.31520 139.52274. 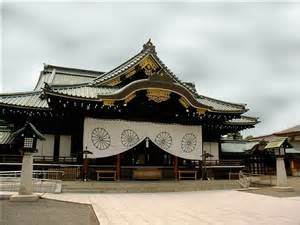 It is located in Tochigi prefecture, north of Tokyo’s center. 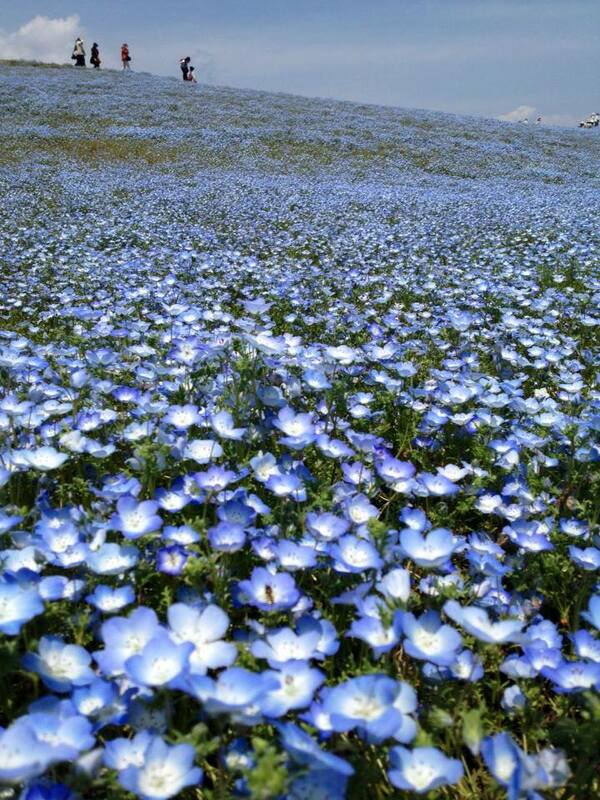 Spring is such a magical time in Japan. Here is a list of some of my favorite places to see spring unfold near Yokota Air Base. Each location is linked to a full trip report with directions and gps coordinates. Do you have another favorite place to add? Great! 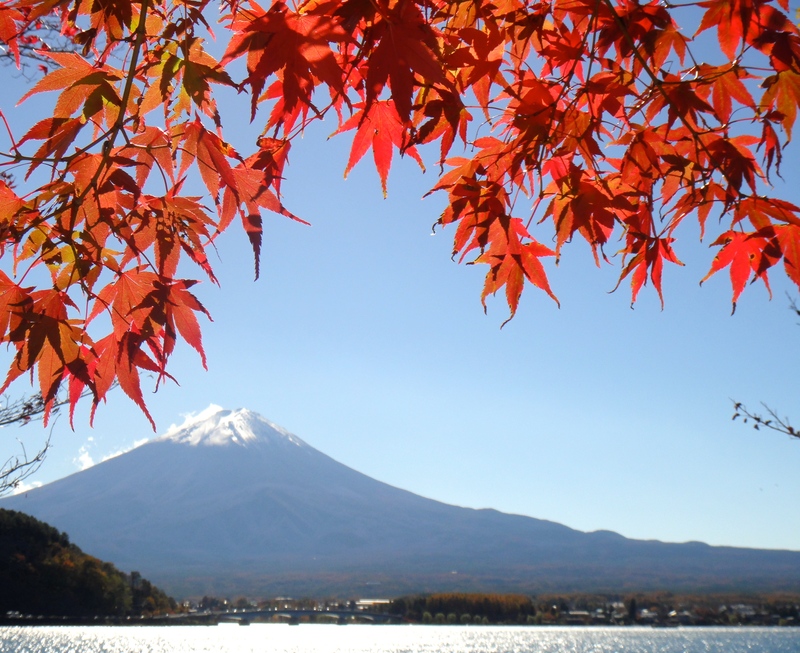 Add it in comments or send us an email: yokotatravel@gmail.com. – Sarah Straus, February, 2014. 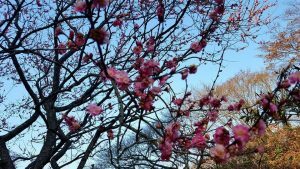 Cherry Blossoms: There are so many great places to see cherry trees in bloom all over greater Tokyo including of course at Yokota. 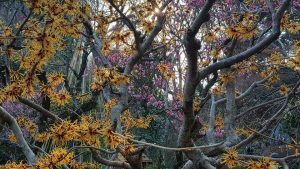 Typically they bloom late March through early April. For one prediction of the 2014 Cherry Blossoms see: www.japan-guide.com/e/e2011.html or www.jnto.go.jp/sakura/eng/index.php. 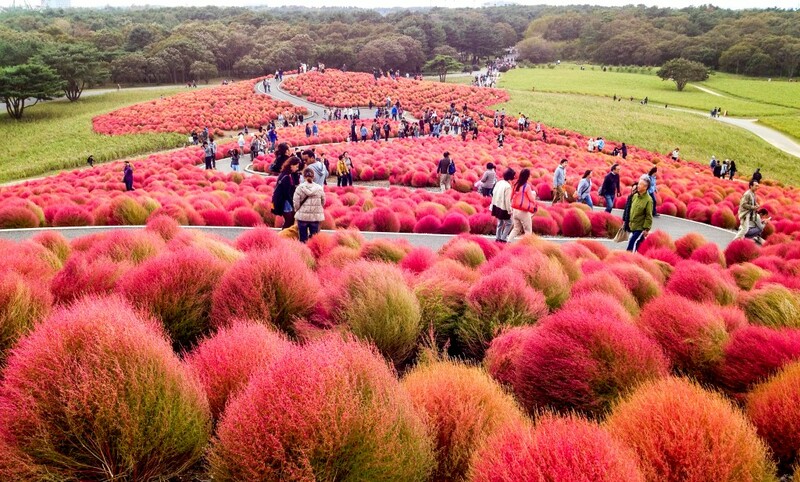 Showa Kinen Park – The cherry orchard is located adjacent to the big center field and the tulip garden. Tama River walk in Fussa – There is a trail that runs along the Tama River and part of it is lines with Cherry trees. It is an especially nice place to run or bike. Koganei Park – There are hundreds of cherry trees here adjacent to the Edo-Tokyo Open Air Museum. Time your visit right and you might go on the free museum day. Photo above taken at Koganie Park on March 28, 2013 – a year the cherry blossoms bloomed very early. Inokashira Park at Kichijoji – I missed seeing the cherry trees here the last two years but I won’t make that mistake this year! I’m looking forward to riding a swan boat under the cherry blossoms! 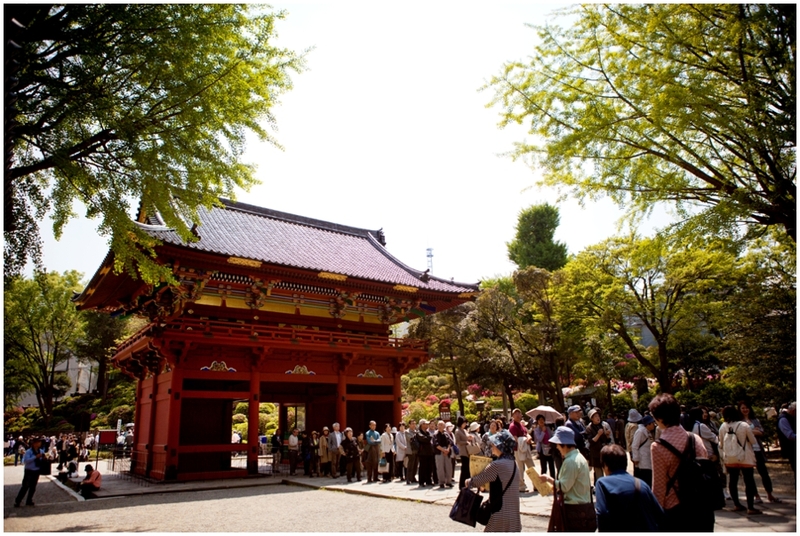 Ueno Park – Ueno park is a popular spot for seeing cherry blossoms in Tokyo. 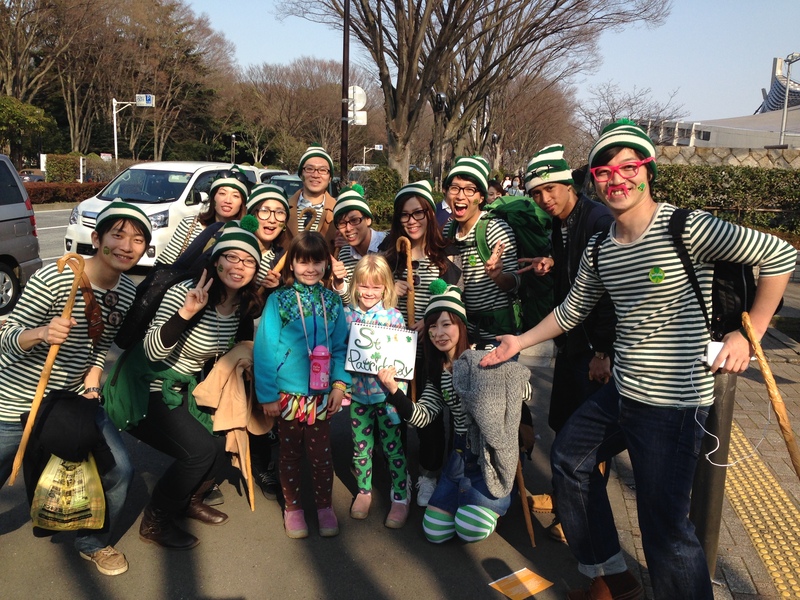 We don’t have a photo for Ueno park… so if you have one, please share! Tokyo River Cruise – There are beautiful cherry trees in bloom along the river at Sumida Park in downtown Tokyo. 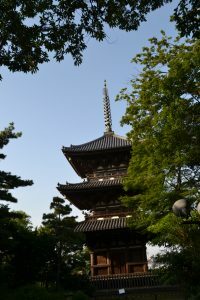 If you start at Sensoji Temple and head toward the river, you’ll run right into cherry trees, a fabulous playground, and nearby a place to board the boats for a cruise up the river. 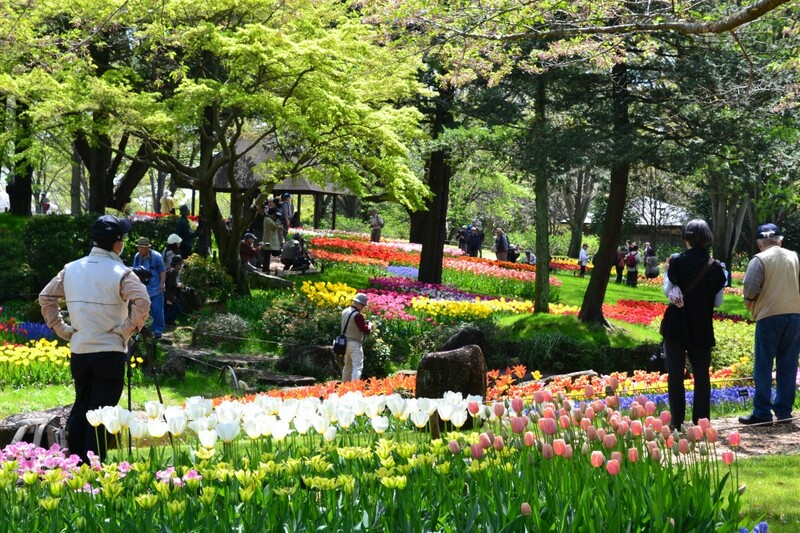 Tulips at Showa Kinen Park – Don’t miss the amazing tulip garden at Showa Kinen Park in April. This photo was taken April 10, 2013. 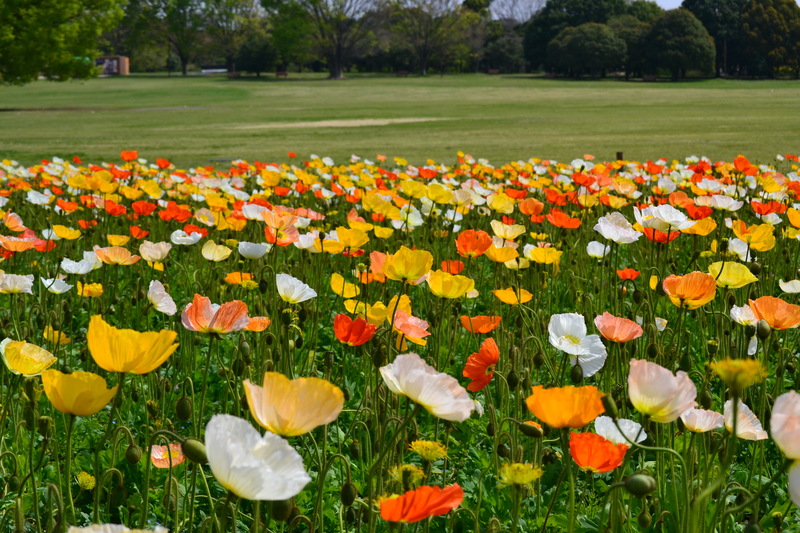 Poppies at Showa Kinen Park – The poppies also bloom in April at Showa Kinen Park and there is a large field of them adjacent to the tulips. This photo was taken April 10, 2013. 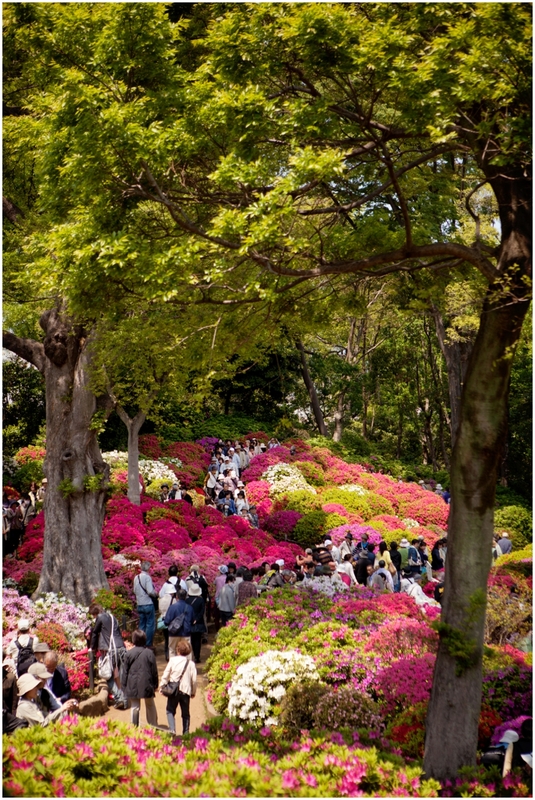 Azalea’s at Shiofune Kannon – The Azaleas at Shiofune bloom late April to early May. This photo was a bit early in the season, taken on April 22, 2013. 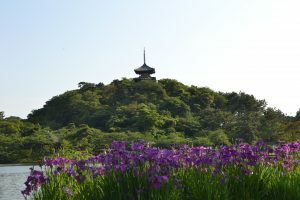 Irses at Fukiage Iris Park – This Iris park, located near Shiofune Kannon, is a great place to visit in June. This photo was taken June 15, 2013. 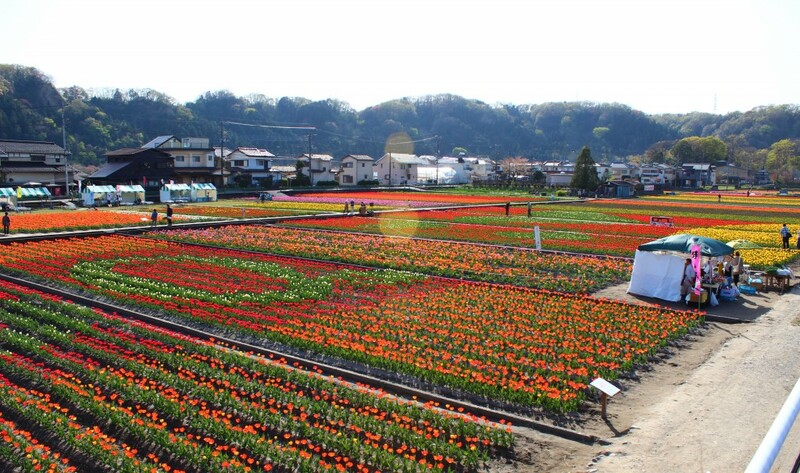 Rebekah Storman, Feb, 2014: Another great spot for viewing the tulips close to Yokota is in Hamura. Half of the year the fields are planted with rice, once the rice is harvested the tulips are planted. This pic was taken with my phone (not the best quality) on April 8, 2013. The parking fee was ¥500. No entrance fee to walk through the tulip fields. There’s a “tower” like structure in the middle of the fields to get a bird’s eye view of the tulips. Taka at the Yujo gave me a hand drawn map last year. That’s the best place to go for directions. GPS: 35.759410, 139.303065. 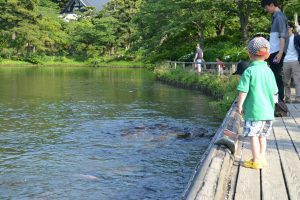 This Showa Kinen-like Park, adjacent to the ocean, has some stunning garden displays, an amusement park, family golf courses, and a BMX course. English maps of the park are available at the Ticket Entrance. 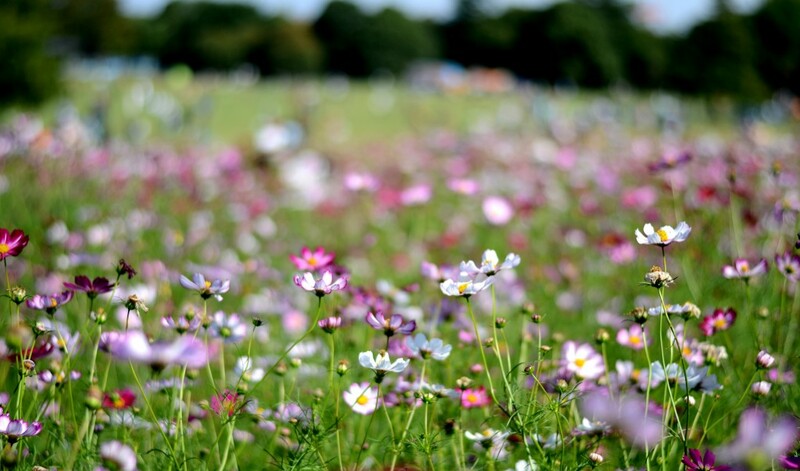 For garden enthusiasts, the park has a number of magnificent gardens that bloom at various times throughout the year. 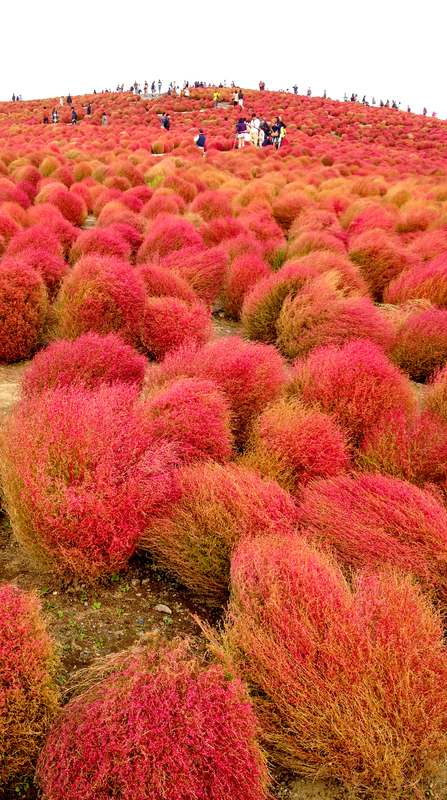 When we visited, in fall (mid-October), the northwestern garden, on Miharashi Hills, was ‘ablaze’ with red Kochia bushes (see pictures). Amazing! 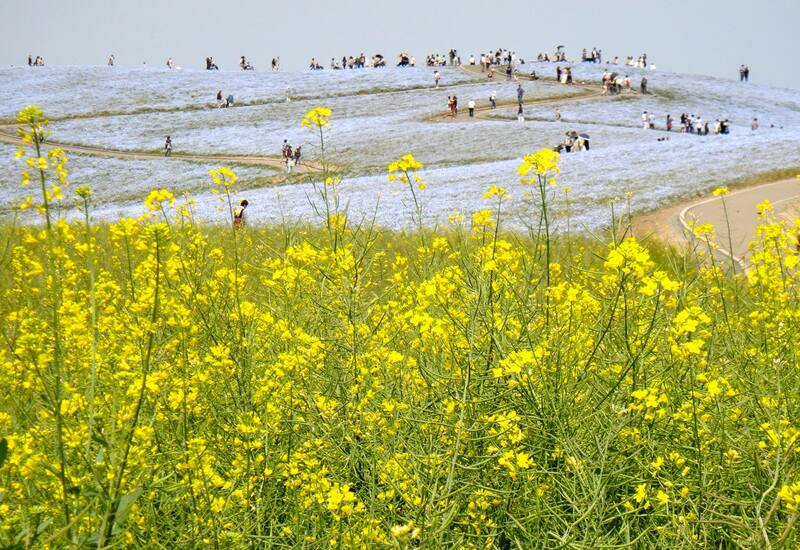 This same area is also very popular in spring (late April – mid May) when the hillside is completely blue with 4½ million Nemophila (‘Baby Blue Eyes’). 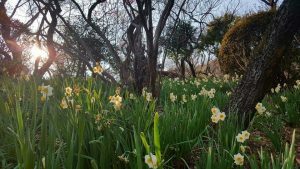 In late March – mid April 1 million daffodils are on display at Suisen Garden, from mid April – late April there is a spectacular display of 270,000 tulips at the Tamago no Mori Garden. 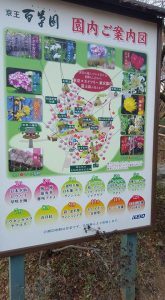 The park’s map has a detailed walking guide around the various garden displays for any time of the year. At the family amusement park, Pleasure Garden, there are 30+ rides, including a giant Ferris Wheel, rollercoasters, a spinning disc, and a labyrinth. 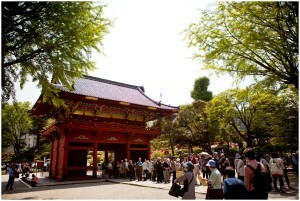 Tickets for the rides are sold separately and cost anywhere between ¥100 – ¥600. There are some height and/or age restrictions for the rides, but these only cover a few of the rides and there are plenty of other rides that should keep under 3 year old and under 120 cm happy. For golf, the park has two courses; The Family Park Golf Course and the Putter Golf Garden. 9 and 18 holes can be played on either course and these cost ¥500 and ¥800 respectively. No 3 year olds are allowed golfing. According to the park’s map, the BMX course is “a real course of BMX specialty”. To ride here, I believe long sleeved clothing, pants, and sneakers are required. On every 2nd Sunday, in each month, there is a free “experience Classroom ‘challenge the BMX’” session. Children, under age 16 need a guardian’s signature to participate. There are restaurants, cafes and BBQ areas (reservations required) located throughout the park. Bicycles can be rented at various places too. Strollers can be borrowed, free of charge, at the park entrance gate. There are miles of bike lanes and just like Showa Kinen Park there is a train that can take you around the park. Cost ¥500. Pets are permitted on a leash. Roller-skates, rollerblades and skateboards are not permitted. 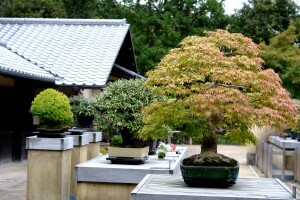 Admission for adults: ¥400. Junior high – Elementary students: ¥80. Children under 6: free. There are discounts for groups over 13 people. Parking at the park costs ¥500. HOURS: Hitachi Seaside Park is generally closed every Monday and on Tuesday if Monday is a National Holiday. There are, however, exceptions to this rule during spring (Mar 26 – May 13), summer (Jul 21 – Aug 31) and fall (Oct 1 – 31) breaks. Most of the time the park opens at 9:30am. 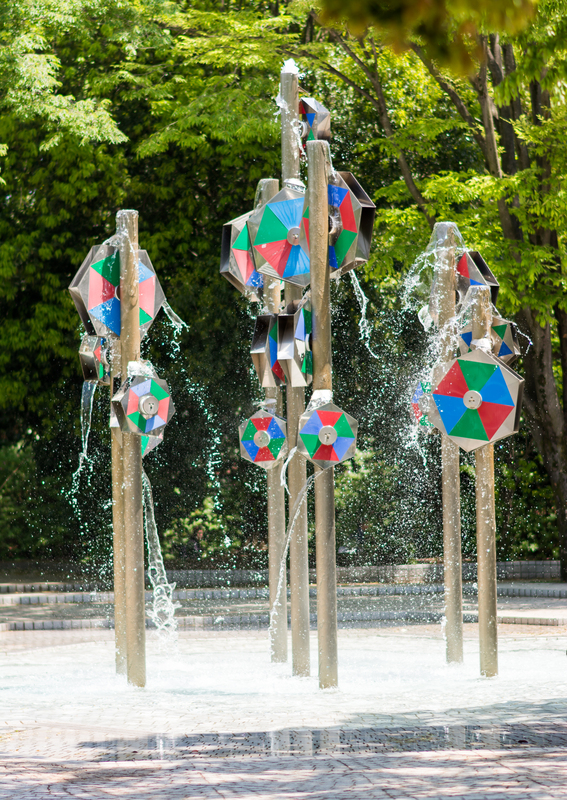 From Jul 21 – Aug 3 the park closes at 6pm and from Nov. 1 to the end of Feb it closes at 4:30pm. The rest of the year it closes at 5pm. If you need more information the park’s phone number is 029-265-9001. DRIVING DIRECTIONS: This park is a 2-3 hour drive Northeast of Yokota and Tokyo. It is near Mito and Hitachinaka Cities in Ibaraki prefecture. 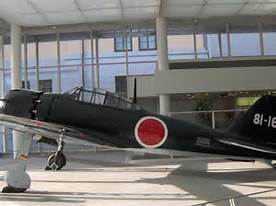 We visited it on the way back from Nikko, which was not ideal, but still closer than Yokota. I believe the road tolls from Yokota to the Hitachi Seaside Park (one way) are between ¥3,000-4,000 depending on the route you travel. There are several large parking lots, and the GPS coordinates to the West Parking Lot are N36.40863 E140.59016. If you plan on visiting Hitachi Seaside’s amusement park or golf courses, I recommend parking in the South Parking Lot. It would be great if someone could give a more detailed review of the Amusement Park, Golf and/or BMX Courses as we only visited the northwestern part of the park. – Linda Bell, December 2013; Baby Blue Eyes photos by Linda Bell, May 2014. Shinjuku Gyoen is one of the largest parks in Tokyo, located walking distance from Shinjuku Station. There are traditional Japanese gardens here, large areas to run and play, a formal French garden filled with roses and a large green house. 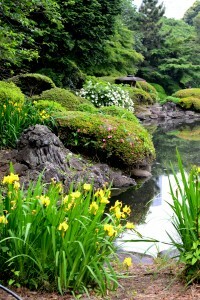 A river runs through the garden with graceful bridges that cross back and forth. 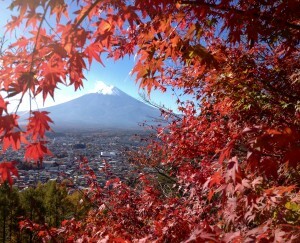 The park is especially nice in the spring when the cherry trees bloom and in November when the leaves turn colors. Bring your own lunch or enjoy noodles/curry at a reasonably priced restaurant in the park. There are also two traditional tea houses located in the park. – Sarah Straus, October 2013 DIRECTIONS: This is an easy park to access by train. Starting in Fussa or Akishima, take the Ome train to Tachikawa. In Tachikawa switch to a train heading to Tokyo, Shinjuku Station. There is a metro stop closer to the parks entrance (Shinjukugyoenmae), but don’t bother transferring here. Exit the station near the Information Booth and turn left. Just walk straight down this street. I always get turned around at Shinjuku Station – but the folks in the well marked information booth are very helpful. Poke your head in there and they will point you in the right direction. Big Bear Chalets, located in Hakuba outside Nagano, is possibly the best cabin that we’ve stayed in. 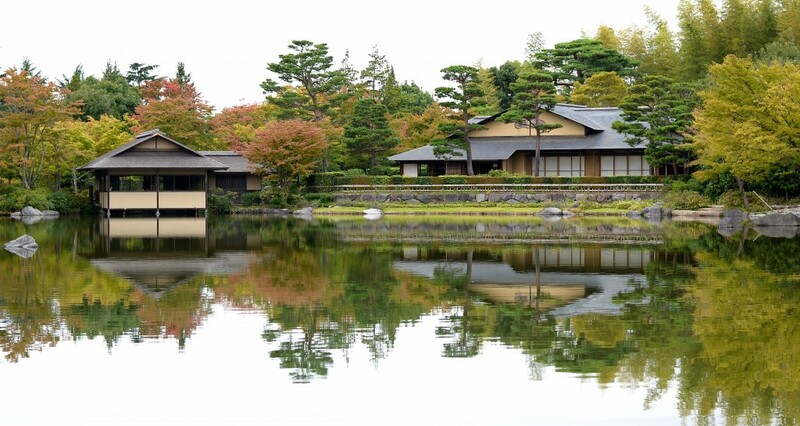 It has all the amenities of a house plus private in-cabin onsen and it makes for a fun destination in itself. We had so much fun at the cabin that we found it hard to leave. Our 2 bedroom cabin fit up to 6 adults comfortably and there’s plenty of space to squeeze the kids in. Bedrooms have American sized full beds. Bring your own food and cook in the full sized kitchen minus an oven. It is located walking distance to local eats (sweet, savory, or noodles – Mexican too) as well as a 7/11. 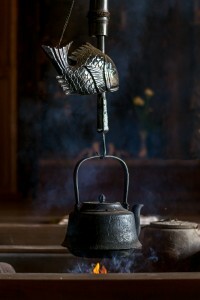 Staying here you can enjoy nature hikes, bike trails, and fishing pond. In winter come for the skiing and walk from the chalet to the ski lifts. Tip: Owner Darrin suggests that the best time for skiing is late March/early April. At that time, there are fewer people, much less traffic and the cost of lodging is almost half the December – March price. The snow quality is much better as well. During peak season (Dec-Mar), the snow is not optimal due to crowds. Hakuba become a popular ski spot after the winter Olympics took place here in 1998. In winter it fills up with Australians and skiers from all over Asia. 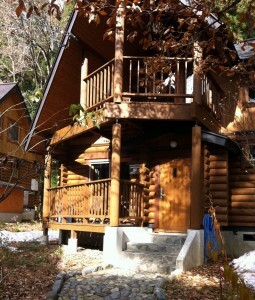 The chalet is expensive, but priced for the unit, not by person. Split the cost with another family or two to make for a more cost effective vacation. Roughly eight kilometers from Yokota is the land of perpetual summer: Summerland. It is a mix of a theme park, swimming pool, game room and restaurants. 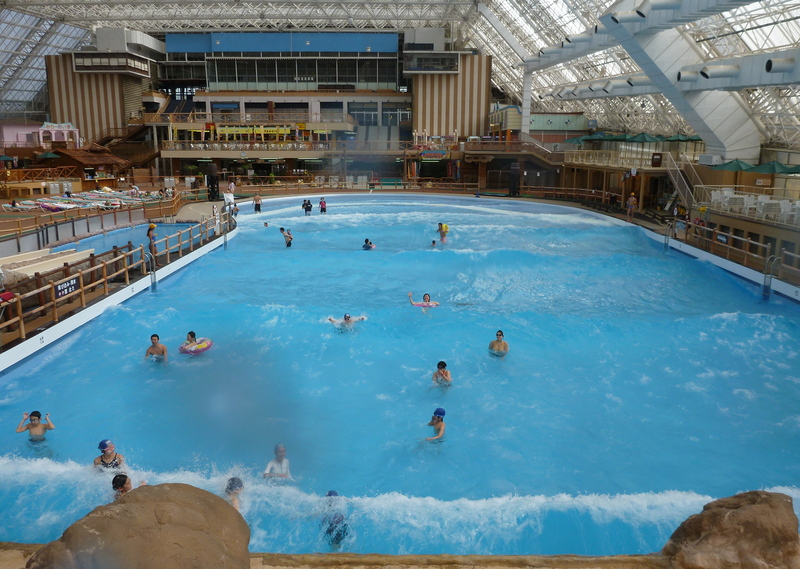 You can spend a gloomy, gray day inside and enjoy the wave pool, large and small water slides and numerous rides underneath the heated dome. In the summer months, an outdoor “Adventure Lagoon,” water slides and amusement rides are available. There are various price ranges. The cost is cheaper off-season when just the indoor pools are open, March – May and October-November. The pools close December-February. If you only want to swim you’ll just need to buy the regular pass not the more expensive free pass. The full price list and opening hours are here. Parking is ¥1200. There are restaurants on the premises, but you can bring your own lunch or a cooler. No tattoos; so if you have them find a swimsuit to cover them. You can also rent a locker in the changing area. 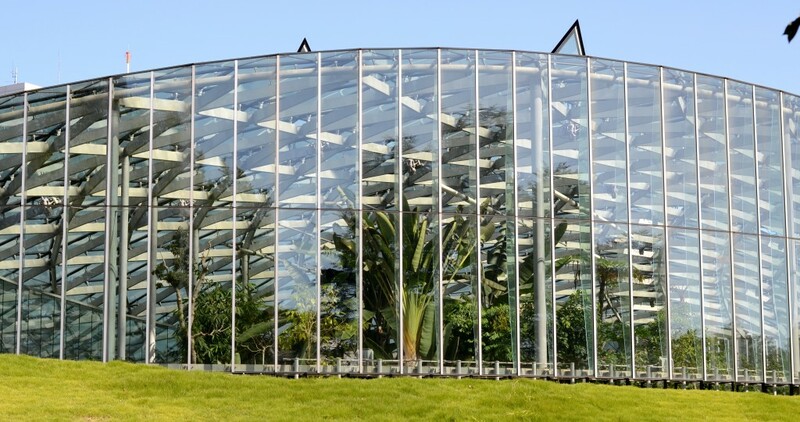 Nearby is Akigawa Nature Park, which charges a modest admission fee. Summerland phone: 042-558-6511. www.summerland.co.jp/english/. GPS for Summerland parking lot: 35.71826,139.27707. Check here for more information on their tattoo policy. – Photos by Michelle Nexon 2013, updated Sarah Straus, 2014. Comments by Sarah Straus, March 2014: I’ve taken my family to Summerland during the spring three years in a row. We started going when the kids were ages 2 and 4 and our last year they were ages 4 and 6. 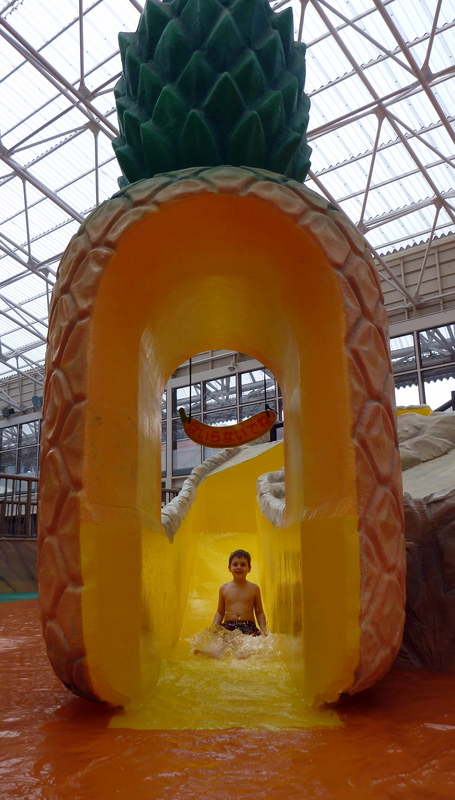 These are great ages for the indoor pools at Summerland. In my opinion the best time to go is early March because the warm humid air under the dome feels so great after a cold, dry winter. 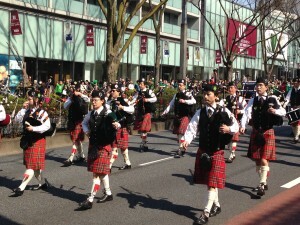 This year we went on Sunday March 2nd. I thought it would be crowded but it wasn’t! It was perfect. Last year we went on a weekday during the first week in March and it was so quiet. We had the place to ourselves and loved it. I have a few tips: 1: Bring a tarp and arrive when it opens to snag your spot. 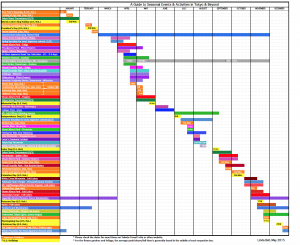 Open times vary, so check their webpage. 2: Your towels and food will likely be OK unattended, but take advantage of the coin locker located next to the wave pool for wallets and phones. You’ll get your ¥100 back. 3. Bring your own food. There are restaurants in Summerland and you can even buy beer, but the food is not great… you’ll be better off feeding your kids PBJ’s and juice boxes in my opinion. 4. Bring your floaties… inner tubes are so fun when the big waves begin on the hour. 5. Don’t miss the grotto rain storm in the basement level which occurs 30 minutes into each hour. 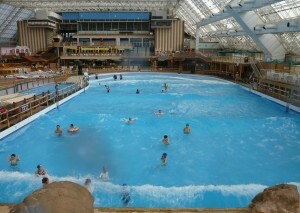 It is so fun and a great place to warm up because there are several large hot tubs. DIRECTIONS: There’s a map on the Summerland website that includes Yokota Air Base, but it may be hard to follow. See our map below.